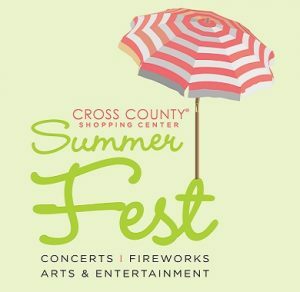 Summer Fest 2018 is at Cross County Shopping Center! This summer we are introducing two NEW Summer Fest events for kids! All events take place on The Green, in the center of the mall. Workshops with the Hudson River Museum: You MUST RSVP for the museum workshops. There is LIMITED SEATING AVAILABLE. EMAIL HERE TO RSVP. For kids ages 5 to 12 years. Each week enjoy food from local food trucks and hear music from the Summer Fest stage. Food Trucks will be located throughout the mall. 10% of proceeds from food trucks will be donated to benefit Feeding Westchester. Look out for samples from mall eateries too. Food Trucks will be different each week – check back here throughout the summer for which trucks will be driving into Cross County!